"Zendesk is a customer service platform that brings organizations and their customers closer together. " 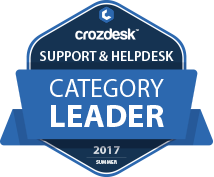 Zendesk scored 82/100 in the Support & Helpdesk category. This is based on user satisfaction (69/100), press buzz (66/100), recent user trends (rising), and other relevant information on Zendesk gathered from around the web. 3.45/5 based on 197 user ratings. What do you like about Zendesk? I can include customized fields, Automate workflow, limitation access to fields based upon consents. They have a user interface for the iphone and it incorporates to their bug tracker. Our clients have their own website for gain access to and I utilized to be able to develop reports, charts and control panels. What do you dislike about Zendesk? They got rid of the menu header that let you leap around in the software application in favor of tiered droplists to walk around. One essential piece that has actually constantly been missing out on is the capability to put the tickets age into a report, Seems like standard things. Likewise, their client assistance generally takes a day to react of they react at all. What have you been using it for and what problems did Zendesk solve? Multitasking Zendesk makes it easy to work with multiple tickets at the same time. Everything remains organized and is constantly updated, so information is not skipped. Also, it seems, there are more functions that I find every time I log into the system. If your basic need is to respond to customer support requests, then Zendesk is an excellent choice. If you are looking for a reliable help center, a phone bank or a CRM solution for your support team, this will not be the power of Zendesk. There really is nothing to say. I think my only tiny complaint would be that there are so many available functions, this can be a little daunting at the beginning. But, as soon as you know what you're dealing with, it's incredibly powerful. We help the client with all the general questions and requests for emergencies. It is very useful that the support of Zendesk integrates with the CRM that we use, as well as with the integration of Jira, so our support team can see customer information and develop tickets along with the request. The interface is clean, simple, and easy to use. At the same time, the app is comprehensive and offers all the features you need to run a customer service department of any size. Ease of system administration and set up. It's easy for administrators to set up and support Zendesk to meet the majority of business needs. Zendesk provides easy accessibility and quick support when we need them the most. With the support ticket system, it would help if you got an e-mail letting you know a client responded. I always submit tickets as solved, that way when it is reopens, I get notified. More levels of admin access can be quite restraining. Zendesk is on the front line for our company. It helps us to manage our customer's tickets and chats with the company. Zendesk allows us to see the life cycle of a specific customer and all of the issues they have run into. We use the platform on our support team and across all customer-facing departments including sales and customer success.